Applying paint to a door with a brush. 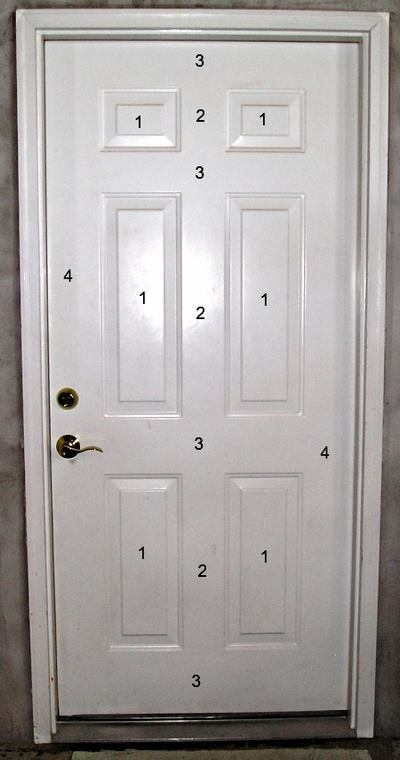 A popular painting method is with a brush and brushing steel doors is an easy project. Painting a steel door is possible with the door installed on the frame or placed on sawhorses. The door installed on the frame will allow both sides to be painted at the same time. Placed on sawhorses will allow easier painting of the frame. 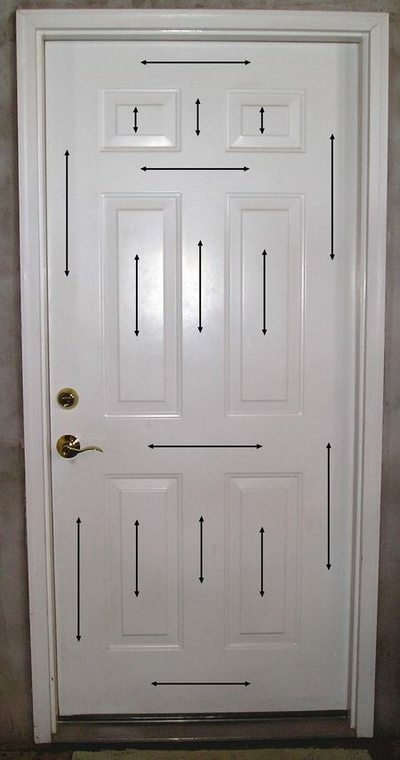 Painting a steel door with a paint brush will produce brush marks. Two ways of minimizing brush marks is by choosing a quality paint brush and using an appropriate paint conditioner. These products are easily found at your local paint store. I use products produced by The Flood Company, Penitrol for oil base paints and Flotrol for water-based paint. Begin with 2-3 ounces in a small amount of paint you are using for brushing, mix thoroughly. More can be added if the brush drags or the paint isn’t flowing well before drying. Always follow the manufactures instructions and use the feel of the paint while brushing as your guide. Plus, working in the shade will help the paint flow on the surface. Brushing primer or paint on steel doors will produce good looking results as long as you properly prepare all door and frame surfaces, use a very good paint brush, choose a good high quality paint and apply the primer or paint in sections and in a sequence to help minimize brush marks. Begin with the door edges and the window frame. Watch out for heavy edges of primer or paint and remove any with the brush or a damp rag. Now, paint the raised panels (#1) and the vertical stiles between them (#2). Begin with the recessed areas and continue to the flat panel faces. End your brush strokes on the flat surfaces of the panels and adjoining stile with vertical brush strokes. Continue with the horizontal rails (#3) and finish with the two long vertical stiles (#4). Try to use long even brush strokes while brushing steel doors in order to minimize brush marks. Brush the sidelights using the same sequence as the door. 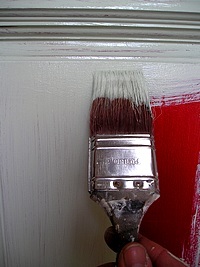 Allow the primer or finish paint to thoroughly dry before recoating. Apply as many coats of finish paint as necessary to achieve an even color and sheen. 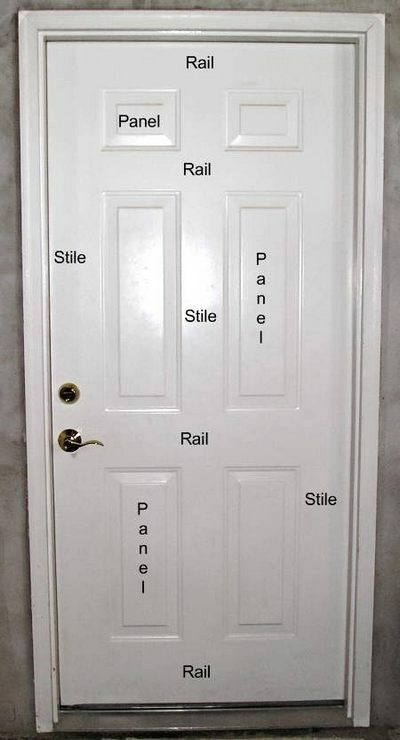 Brushing steel doors usually requires one coat of primer and two coats of finish paint.